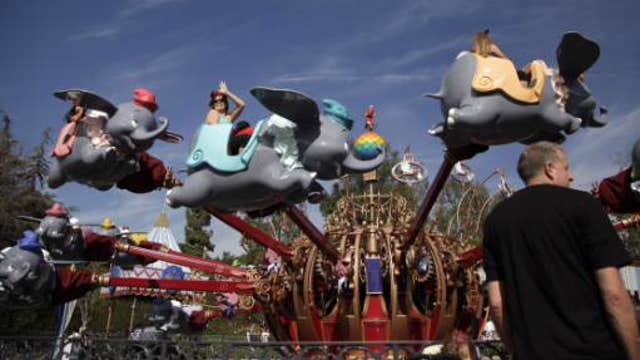 Earnings HQ: FBN’s Ashley Webster breaks down Disney’s fiscal second-quarter earnings report. Walt Disney Co&apos;s <DIS.N> quarterly revenue beat analysts&apos; expectations, helped by increased spending by visitors at its theme parks and strength in the company&apos;s TV networks business. The company&apos;s shares rose as much as 2 percent to a record high of $113.30 in early trading. Up to Monday&apos;s close, they had gained 38 percent in the past year. Results for the quarter were also boosted by a surge in sales of toys and merchandise related to blockbuster animated film "Frozen". While the studio business failed to keep pace with last year&apos;s "Frozen"-fueled growth, "The Avengers: Age of Ultron" is expected to boost revenue in the current quarter. The sequel opened last weekend with $191.2 million in ticket sales in the United States and Canada — the second-biggest opening of all time. "As much as the quarter itself was strong the outlook for the next few quarters, with so many big franchise properties coming to market, looks to be just as good," Macquarie Research analyst Timothy Nollen told Reuters. Revenue at theme parks rose 6 percent to $3.76 billion, pushing up the unit&apos;s operating income 24 percent as ticket prices and hotel room rates increased and visitors spent more on food, drinks and merchandise. Total revenue rose 7 percent to $12.46 billion in the second quarter ended March 28, topping the average analyst estimate of $12.25 billion. Net income attributable to Walt Disney of $1.23 per share also beat the average analyst estimate of $1.11 per share, according to Thomson Reuters I/B/E/S. Walt Disney&apos;s media networks business, which includes sports powerhouse ESPN, the Disney channels and ABC, reported a 13 percent rise in revenue to $5.81 billion, helped by higher ad sales and affiliate fees. Higher programing and production costs at ESPN, however, pushed the unit&apos;s operating income down 2 percent. ESPN is engaged in a fight with Verizon Inc <VZ.N> over customized TV packages that leave the sports network out of the basic channel bundle. The network sued Verizon last week, saying it was violating their contract. "We are certainly willing to work with various distributors to come up with packages that are of value to their consumers and also continue to provide value for us," Disney Chief Executive Bob Iger said in an interview on CNBC. Revenue at the studio business dropped 6 percent to $1.69 billion, while sales at the consumer products division rose 10 percent.